Home Client Side Object Model (CSOM) Content Type PnP PowerShell PowerShell SharePoint Online SharePoint Online: How to Get Content Type ID using PowerShell? 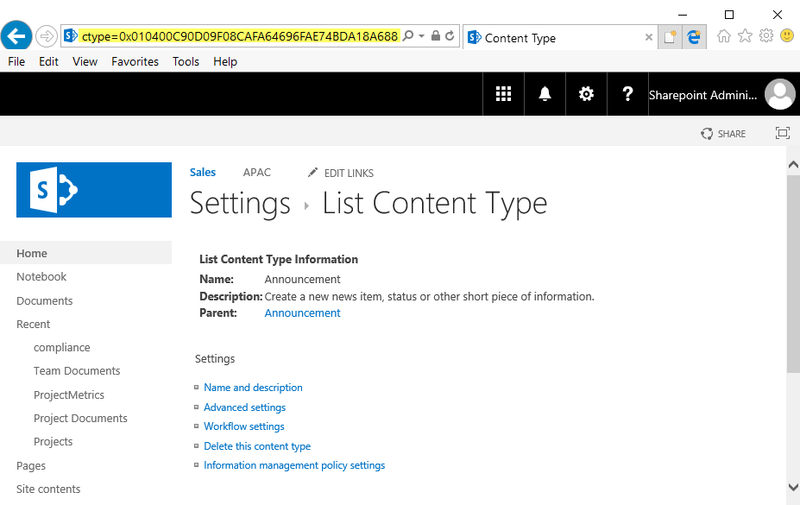 SharePoint Online: How to Get Content Type ID using PowerShell? My other article speaks on How to find the content type id in SharePoint, using SharePoint UI and PowerShell for SharePoint On-premises, This post provides script to get content type by id programmatically for SharePoint online. How to Find Content Type ID in SharePoint Online? To get the content type ID in SharePoint Online, you can Go to List/Site Content Types >> Pick your content type >> The URL will have "Ctype" parameter with the content type ID! Here is the PowerShell script to get content type id in SharePoint using csom code. This script gets Content Type ID from Name using PowerShell. Similarly, To get the content type ID at list level, use: -List parameter. E.g.